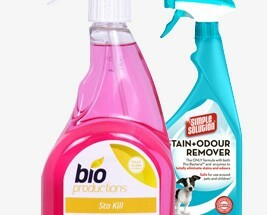 Pet Stain and Odour removers have been specifically designed to remove organic pet stains from carpets and hardfloors leaving your home fresh. The powerful enzymes break down stains removing them with ease whilst leaving a fresh and pleasant smell. Suitable for use all over the home and on various surfaces and fabrics. Highly absorbent powders are also available that clean and freshen.